conference called the 12th International Conference on Knowledge Engineering and Knowledge Management. The EKAW acronym and series number (currently the 12th) are maintained. 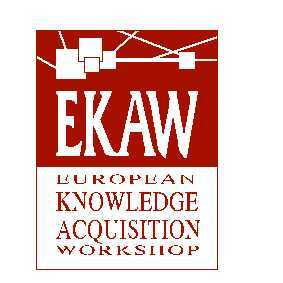 EKAW'2000 aims at gathering researchers working on any area concerning methods, techniques and tools for the construction and the exploitation of knowledge-intensive systems and for knowledge management. Languages and frameworks for knowledge engineering and knowledge management. Tools and techniques for knowledge engineering and knowledge management. Acquiring knowledge through machine learning, data-mining and knowledge discovery in databases. Knowledge management, enterprise modeling and corporate memories. Methods and techniques for reuse of knowledge and knowledge models, in particular related to the construction, use, and maintenance of supporting libraries of problem-solving methods and ontologies. Knowledge engineering and knowledge management over the Internet. Agent-oriented approaches to knowledge engineering and management. Use of knowledge engineering approaches for intelligent information integration, knowledge retrieval and meta-content descriptions. Evaluation of methods, techniques and tools for knowledge engineering and knowledge management. Software demonstrations related to presented papers are also encouraged. Accepted papers will be published in Springer's Lecture Notes in Artificial Intelligence. Long papers should not exceed 16 pages, short papers 8 pages. Papers must closely follow the Springer Guidelines. Papers are due by July 7. Authors should submit a full paper electronically either as a postscript, html or pdf file by emailing the according URL. In addition, authors should submit an ascii version of their title page by email. The first page of submitted papers should include: title, author names, affiliations, postal addresses, electronic mail addresses, telephone and fax numbers for all authors, and a brief abstract. All correspondence will be sent to the author designed as contact person in the electronic title page. Submissions should not exceed 6000 words and should be printed on A4 paper with at least 1 inch margins on all sides. Notice that, since the proceedings will be published as LNAI, authors using LaTeX may already use the Springer style files. The registration conditions are described above (click on "Venue information") and the registration form is accessible by clicking on "Registration".